Great Walk number 5! As New Zealand’s best known walk we were lucky to secure dates over the Christmas holidays. The Department of Conservation (DOC) handles the transport for this walk at the time of booking. Six months after making the reservation we visited the DOC site in Te Anau to collect our tickets. After a 30-minute shuttle to Te Anau Downs and a 1-hour boat ride across choppy Lake Te Anau we disembarked at Glade Wharf. Standing still for more than ten seconds encouraged the sandflies to attack so we immediately began our first day on the Milford Track, a 54 kilometer journey connecting Lake Te Anau with Milford Sound. 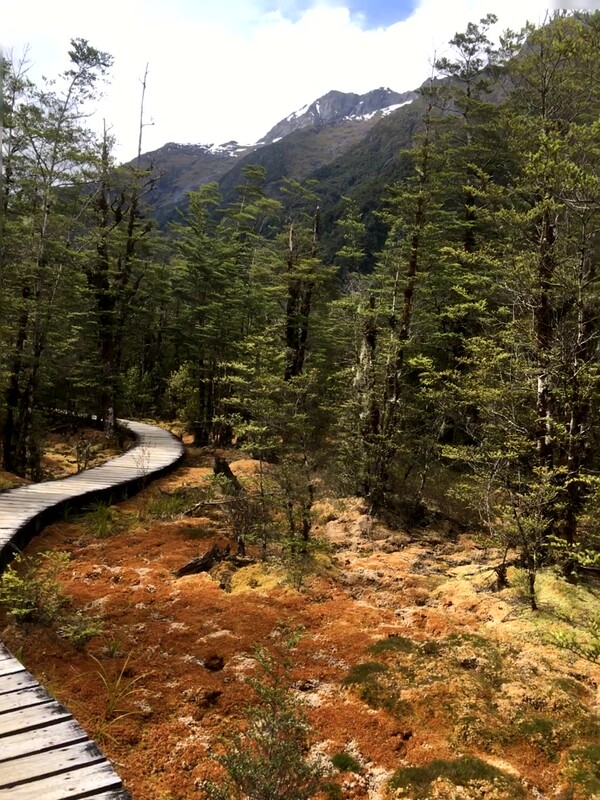 Due to its popularity, the number of visitors to Milford Track is limited. As a result, trampers are required to walk in one direction (north) and must complete it in four days. Allen and I would have preferred to skip the first hut and continue to the second and complete the trek in three days. 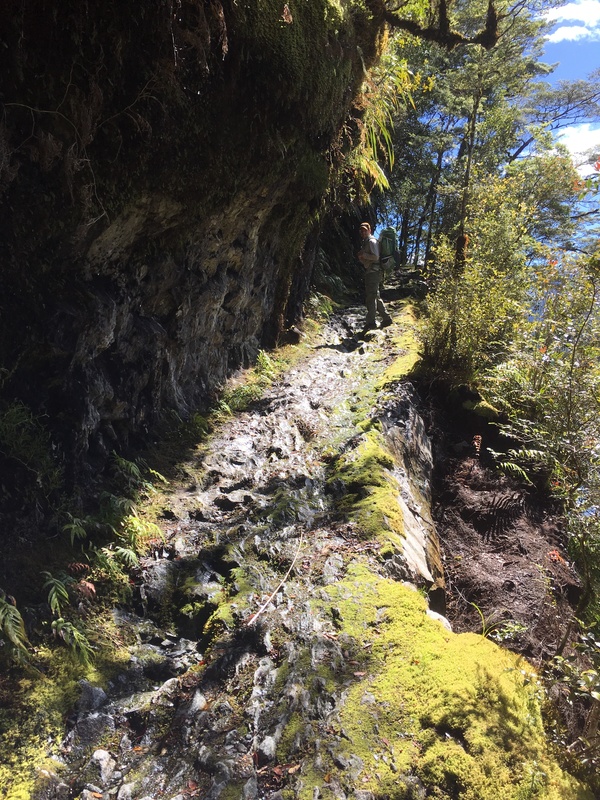 That is not an option on this trail so we enjoyed a leisurely 5km stroll from lade Wharf to Clinton Hut. This section follows the Clinton River and we spent time looking for trout. The Wetland Walkway is a 15-minute side trip. The trees fade away as an elevated walkway protects the fragile, and colorful, wetland flora. As predicted, we woke to rain on day 2. For awhile we tried to keep our feet dry and eventually gave in to the puddles and streams. At one point we were wading through water up to our knees while walking across and elevated boardwalk. 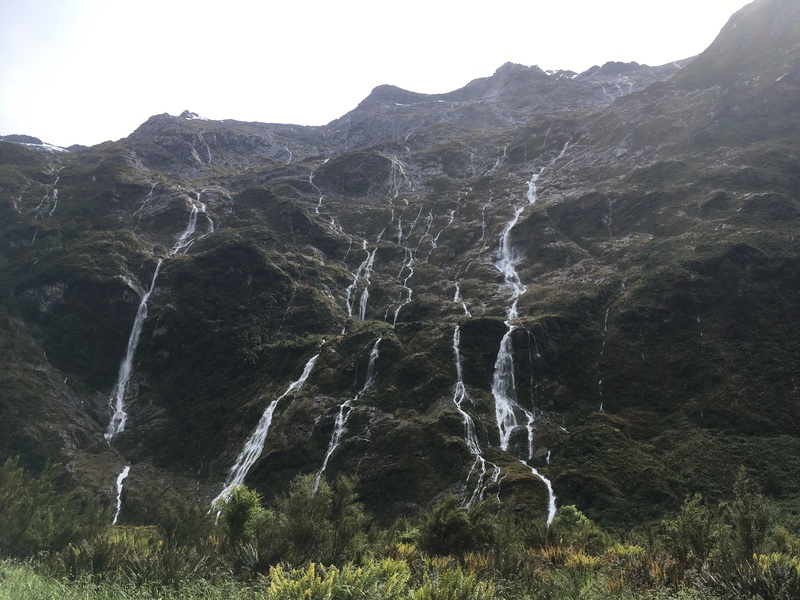 For the most part we were protected from the elements by rainforest, but as we entered Dead Lake we got a view of all the spontaneous waterfalls. It was spectacular! And short-lived. All these waterfalls gifted by the rain would disappear in 1-2 hours. Despite the weather we took a 10-minute detour to Hidden Lake. Various birdlife made themselves known including weka, tui, fantails and the South Island bush robin. After a soggy 16.5km we reached Mintaro Hut with squishy socks and hung out wet clothes on the covered porch. The next morning a gang of local kea provided a 5am wake-up call outside our bunk. At 14km, day 3 is the shortest distance with challenging elevation changes. From Mintaro Hut there is a well-graded, zigzag climb of 500m to the Mackinnon Memorial. From there it is an easy 30-minute walk through Mackinnon Pass, the summit (1154m), to Mackinnon Pass Shelter. This is the perfect spot for a morning tea break for a few reasons. First, the elevation is too high for sandflies! 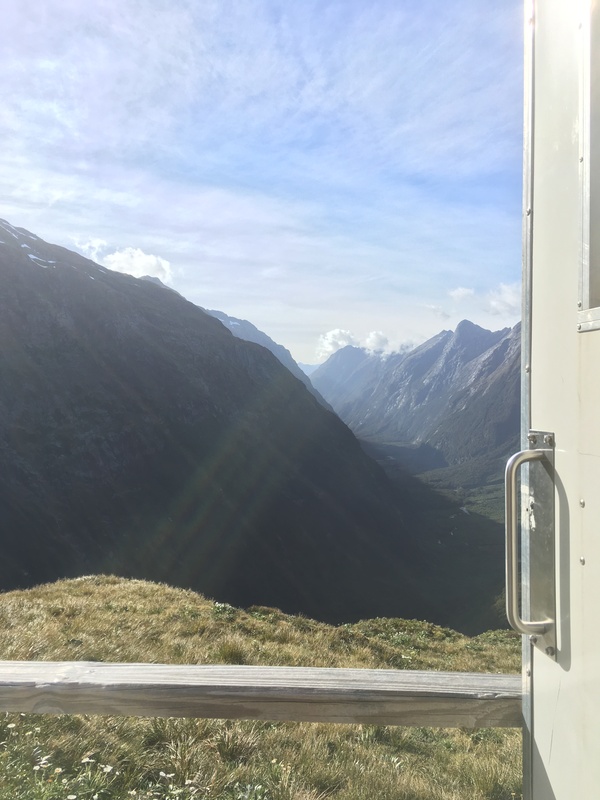 Second, a visit to the ‘loo with a view.’ The toilet at the shelter is known for its stunning view of Fiordland. Finally, the shelter has a gas cooker. We warmed up with a cup of tea. After a nice break we began the 1000m descent over uneven, rocky terrain. The views and numerous waterfalls distracted us from the challenging topography and provided ample excuses to pause our workout. After a couple hours we reached Quintin Shelter. The glampers finish their day here, but we had to carry on for another hour to reach Dumpling Hut. Before continuing on the main track, we opted for a 2-hour side trip to Sutherland Falls. The glamping lodge provides a shelter with tea and coffee – pure luxury after three days of hiking – and a space to keep bags away from mischievous kea during the waterfall hike. Following this interlude we rejoined the Milford Track and reached Dumpling Hut shortly after 3pm. We departed Dumpling Hut at 8am – a late start, but we were trying to line up our finish with the 2:00pm water taxi. The last day is a relatively flat 18km to Sandfly Point. We walked along Lake Authur and the massive Lake Ada, and over stone cutting completed 120 years ago. Despite being one of the first sections completed, the stone cut portion requires the least maintenance. We climbed under Bell Rock and relaxed on the rocks below Giants Gate Falls. Although we tried to pace ourselves we still arrived at Sandfly Point ahead of schedule. Thankfully there was a water taxi already there and we did not have to wait long for the 10-minute cruise across the sound. From there we took a couple buses to get back to Te Anau by 5pm. By this point we were hungry and ready for a hot shower! Accommodation: DOC Huts: Clinton, Mintaro & Dumpling. Double room at YHA Queenstown Central before the trek. Before the hike, walked along the shores of Lake Wakatipu. The backpackers in Queenstown come out on Christmas Day to party in the sun.